Natural rush and paper rush are woven the same, but are very different materials! 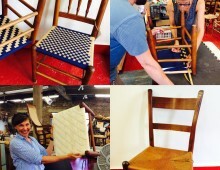 Learn to weave a chair with paper rush. Learn to weave with paper rush on a chair or stool with four rails. How do I know if my chair has paper or natural rush? 1. Paper rush is a more solid cord, even in color. When broken, it usually occurs across a rail as if it were cut. Natural rush has variations in color and it will flake off like dried grass when broken. 2. Paper rush looks the same on the top and bottom of the seat. 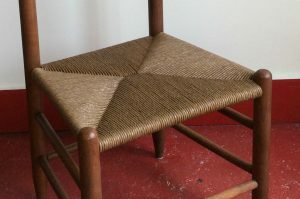 On a natural rush seat, the bottom of the seat will have cut ends of plant fiber in an x shape that follows the pattern. *You must show proficiency in paper rush before moving on to natural rush. General: Rush weaving dates back thousands of years to ancient Egypt. Normally bundles of grass are twisted and then wrapped around the rails of the chair. 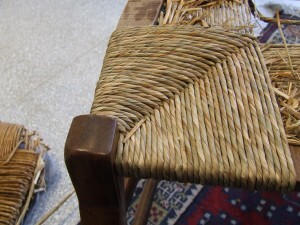 Learn to weave with paper rush on a standard chair seat made of four rails. Learn to weave a chair seat with paper fiber rush. Class Length: At least 8 hours, often 10-12. Can split into 2 days or take one long day (see Boot Camp dates). Cost: $250 Includes up to twelve hours of instruction, all tools/materials needed to complete one chair seat, & after-class assistance on future projects. After the class: your new seat will need a shellac coating. The chair should dry overnight first. We can do this for you and you can pick it up the next day, you can return to the shop the next day and do it yourself, or we can send you home with simple instructions to do it yourself. Rocking Chairs are generally not suitable for a class setting. Send us a photo of your chair if you wanted to learn on a rocker, we may be able to accommodate if it is small. If your chair has wooden edging to remove from the sides of the seat, this must be done before class. We can remove and re-attach the skirts for a fee but this should be done AT LEAST ONE DAY BEFORE CLASS and will require 1-2 days after the class to reattach and match color. This could be done by any furniture restoration professional in your hometown.